A real opportunity for puffinophiles has cropped up! 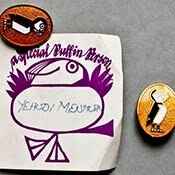 The Royal Academy of Music has put Yehudi Menuhin’s puffin badges on display for object of the month – they were chosen as the April (fools) object(s) of the month. This is the only opportunity that you will have to see the Presidents special ‘Gold’ badge. It looks a deep orange/red version of the founders badge. 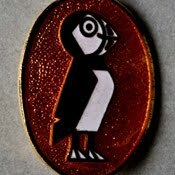 As I mentioned in a previous posting, this was given by Kaye Webb to Menuhin on his acceptance of the role of President of the Puffin Club after the death of the previous President, Sir Allen Lane. I would like to thank the Royal Academy of Music for contacting me regarding these rare items – it has given me the excuse to express my admiration for an extraordinary man whose world view was so enlightened. I will be posting a more expansive post on Menuhin and his involvement with the club shortly. I was a Puffineer in the early 70s. Does anyone else remember an opportunity that Menuhin gave the club, by allowing a couple of children from participating schools to attend a rehearsal ? I went and saw Holst’s St Paul’s Suite among other things but don’t know where (apart from London), when (though 72-74) and which orchestra (though I think it may have been his own school). Any clues ? Ps and thanks for the site !